A high-potency formulation of eight hardy species of proprietary blend containing —5+ Billion CFU’s selected for maintenance on a daily ongoing basis after using the kit to alleviate your skin fungus problems. This selection is effective for skin problems of the feet as well as (candida) yeast infections and soothing urinary tract infections. The probiotic species in the “APD I ” formulations synergistically produce additional probiotic microorganisms that lower the pH of intestinal contents and inhibit the growth of viral pathogens and bacterial yeast. 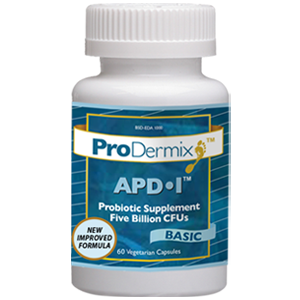 The “APDI” probiotics produce B vitamins that help enhance the absorption of minerals and nutrients in the body. 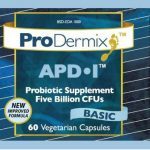 The above-mentioned three highly potent strains of probiotics plus the five additional hardy species in our “APDI” formulations stimulate the gastrointestinal tract and the systemic immune system to function in a healthful and reenergized, pathogen free environment. At the same time, these formulations provide support for people suffering from fungal skin of the feet and yeast infections (candida). Bifidobacterium bifidum, Lactobacillus rhamnosus, Bifidobacterium lactis, Lactobacillus casei, Lactobacillus paracasei, Bifdobacterium longum, Streptococcus thermophilus, and Lactobacillus plantarum. Inulin base (derived from chicory root) and vegetarian capsule (hydroxypropyl methylcellulose, water). Contains no sugar and artificial colors, flavors, or preservatives. It is a transient species with a long history of use as a starter culture for yogurt and cheese. It is used for fermentation end-products that inhibit pathogenic bacterial proliferation. It reduces DNA damage and premalignant lesion formation by protecting against carcinogens. It supports normal microflora and helps the gastrointestinal function in conditions ranging from rotavirus diarrhea in infants to remission in ulcerative colitis.